Let’s create a multi-function LED lamp, always connected via wireless, thanks to Arietta G25. The here-proposed project follows this trend and is dedicated to the lighting, since it is a RGB lamp (thus capable of taking all the colours) and manageable by means of devices that are connected via Wi-Fi. 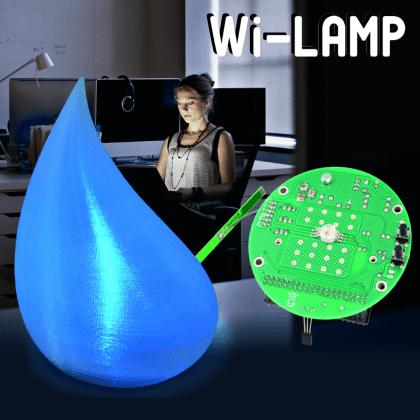 The heart of the lamp, that we baptized Wi-Lamp, is a board having a wireless interface, and mounting a RGB power LED, and also has a terminal box that allows, as an alternative, to command RGB strips, thus allowing us to lighten whole spaces. 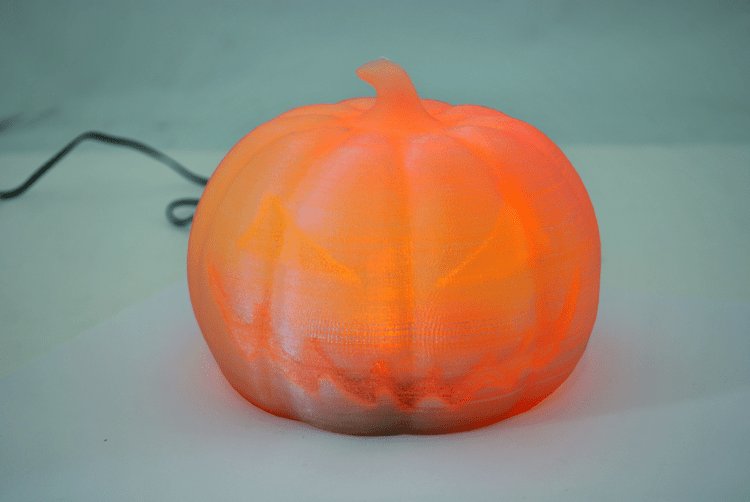 As for the usage as a single lamp, Wi-Lamp’s circuit can be included in a commercial lamp, such as a bedside lamp, or in a shell having the desired shape, and printed via a 3D printer; concerning this, we would like to remind that by searching for “lamp” on the thingiverse website, many examples may be found. 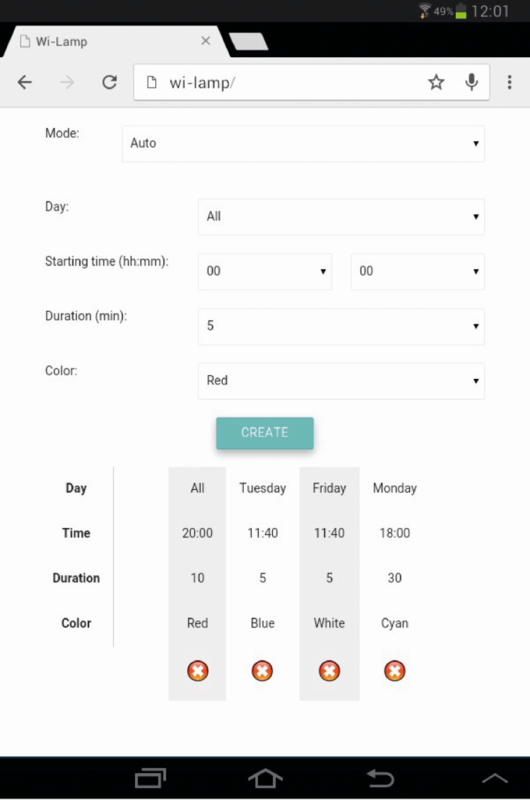 Auto = by means of this mode, it is possible to program the lamp, so that it (or all of them) will be started on a certain day of the week, at a certain time, for the desired duration and time; after having set all the parameters, you need to press the “Create” button in order to save the planning and, in order to delete the planning, you need on the other hand to press the red round icon with an X. In order to prepare Arietta’s SD card we may download either the Linux image that is ready from our repository website, or the last available image for Arietta, from the “Download” section at the acmesystems website (the file is “arietta_with_wifi.img.zip”). In both cases we have to write the image on the SD card, by means of the Win32DiskImager software, that may be freely acquired at the following address: sourceforge.net/projects/win32diskimager/. Let’s type in the data of our Wi-Fi network in the place of “WiFi_Name” and “WiFi_Password”, and then close and save the file by means of CTRL+X, Y and RETURN. In both cases we have to comment the gateway 192.168.10.20 line, contained within the /etc/network/interfaces file; weren’t it commented, Wi-Lamp would not be able to connect to the Internet by means of out Wi-Fi network, so to synchronize the system clock. With the said line commented, we will no longer be able to reach Arietta via the USB connection, but only by means of the Wi-Fi connection. ifconfig. If everything reached a successful conclusion, and Arietta connected to our Wi-Fi network, we will turn it off by means of the shutdown -h now command. In the case we had chosen to download the image to be prepared from the ACME Systems’ website, after the connection as “root” via PuTTY, we will move to the acme user home by means of the cd /home/acme command. bash setup.sh MiaRete MiaPassword WPA. After having pressed the RETURN button, the installation procedure will start: it will last around 40 minutes, and will use your PC’s Internet connection that is shared with Arietta via USB. The setup.sh file deals with carrying out the update and the Linux distribution’s upgrade, so to manage: to update all the packages, to copy the Arietta pins’ configuration file in the boot, to install NTP in order to synchronize Arietta’s time with the Internet, to install the Python’s libraries needed to use Arietta’s configurable pins, to change the system’s hostname in order to reach the lamp (by typing in http://wi-lamp from the browser), to copy all the web control panel files under /var/www (thus making a backup of the preexisting files), and finally to configure the Wi-Fi network with the parameters we initially gave to it (network’s name, password and kind of protection). At the end of the setup, a paragraph will appear on the terminal, starting with “Setup is finished, Arietta will now shutdown.” The IP with which to reach the lamp will be indicated, should the http://wi-lamp address appear not be working, because of restrictions on the home router. Whatever button will turn Arietta off. wi-lamp.php: it deals with receiving asynchronous commands from index.php and with the populating of all the files in the storage/ folder. The lamp.py file may thus be considered as the main Wi-Lamp’s script: at each second it checks if the mode has changed, while every 0.15 seconds it extracts the data concerning the current mode; if we were in the Fade mode the speed file would be read, so to control the fading speed. Now, let’s deepen our knowledge of some aspects concerning the modes: OFF simply sets the R, G and B to zero every 0.8 seconds, so to keep the lamp turned off. 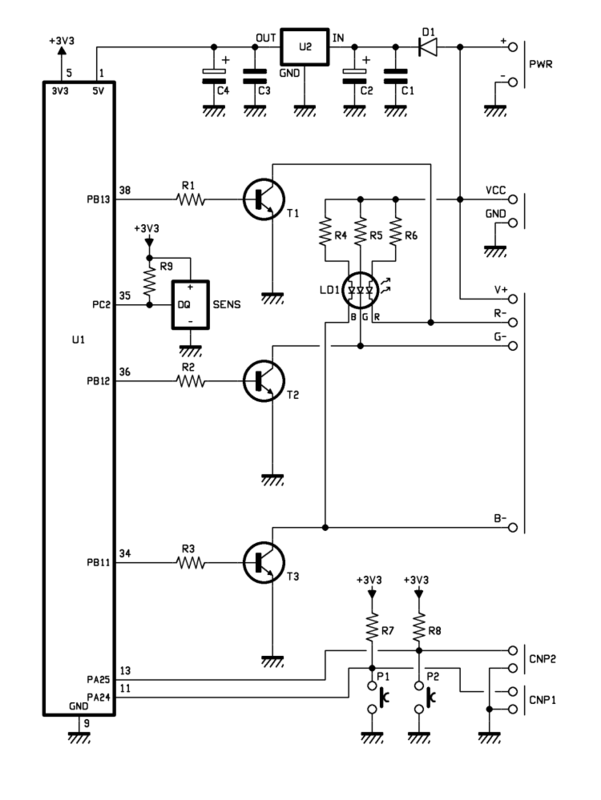 Self continuously reads the color file, and every 0.2 seconds, it sets the value read at the LED. Each time the Fade mode is recalled, it moves the current hue one step forward, by lowering a colour and raising the following one: in fact, it begins from a starting situation such as 255, 0, 0 (red) so to slowly fade to 0, 255, 0 (green) and to finish the round with 0, 0, 255 (blue); the speed with which this function is recalled depends on the value contained in the speed file. The Party mode randomizes the three LED colours and sets them with a time interval depending on the value contained in the speed file. Sunset essentially executes three operations, one excluding the other ones: if the sunset start button has been pressed (thus reading from the sunset_start file), it sets the lamp in “busy” mode, if the lamp is in “busy” mode and the sunset duration has passed (the minutes may be set from the web control panel, and are read from the sunset_duration file), it frees the lamp and sets it to OFF; while if the lamp is “busy” and the minutes of the sunset duration have not passed yet, it deals with running the hue that from the white goes through all the sunset colours, until it is completely turned off. The Sunrise mode is very similar to the Sunset one, with the difference that the dawn animation starts when reaching the time set from the control panel (sunrise_time file) and the lamp, from being turned off, goes through all the hues that are typical of the sunrise colours, until it is completely white lighted; even here there is a duration (in minutes) that can be set (sunrise_duration file). The Temperature mode reads the temperature (as measured by the sensor) every 0.8 seconds, and sets the lamp of the colour obtained from the blue-red hue and from the minimal and maximum temperature values, as previously set on the temperature file. The Fire mode randomizes a colour from the red-yellow hue, every 0.1 seconds: it is not possible to set the speed for this animation. The Auto mode (named Automatic in the source code) extracts the list of the lamp start schedulings from the auto file, and every 0.8 seconds; it analyzes them, one by one, so to understand if the day and the starting time correspond to the current ones and, being the case, it sets the lamp in busy mode, for the duration set in the scheduling, by colouring the LED with the preset colour; in the end it turns off the LED and “frees” the lamp, that goes back to be ready for another automatic ignition. 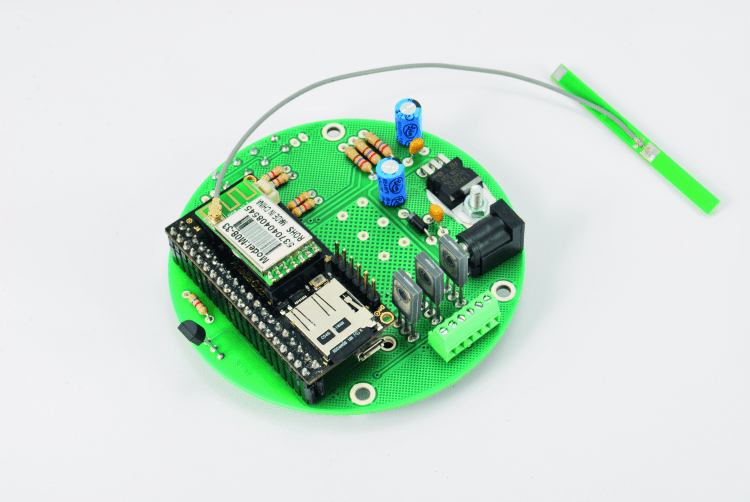 25 euro to make a lamp… why don’t you use esp8266? 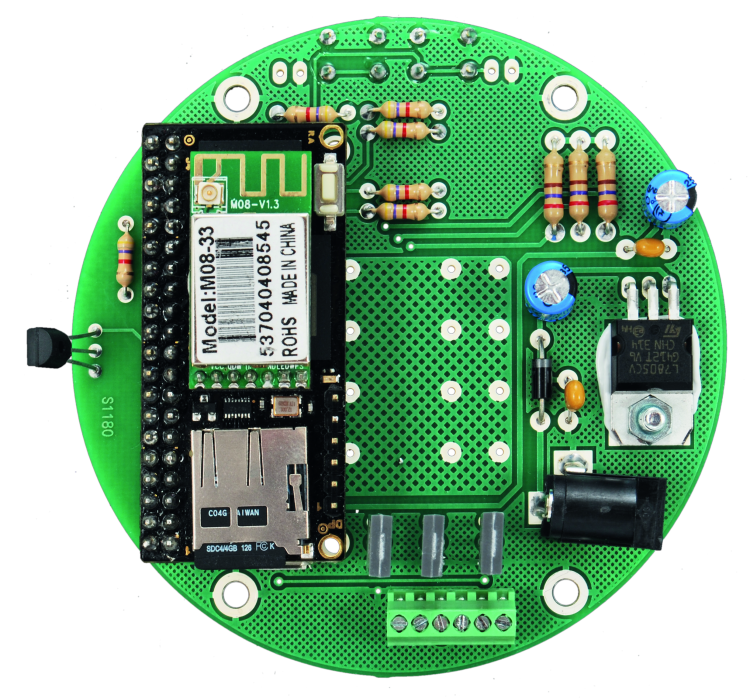 This is the whole kit, with ESP8266 you have to build your own board.